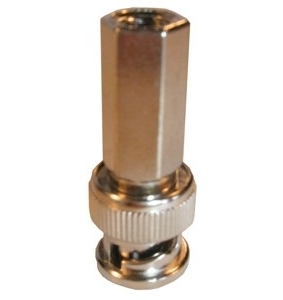 BNC Twist-on Connectors are great for use for the novice and professional CCTV installer. They do not require any tools except for a coax wire stripper. All you have to do is strip your RG59 coax wire exposing the center conductor, and twist these connectors on to the cable end. It is a good idea to also secure the connector with some electrical tape or heat shrink to protect the end from getting water inside.